Look! Yesterday was Wednesday and I took my photos - as I've been so good at doing for these three full weeks - but I haven't let them sit until Sunday! It's only Thursday. I'm so proud of myself. The garden is really starting to come along. Things are starting to grow like mad. We need to get something for the peas to start trailing up, they are really doing well. So are the carrots - EDP has already thinned them once and will need to do them again soon. The strawberries on the balcony are full of blossoms, I think we'll easily get 3 dozen or more berries this year. The zucchini, the squash and one of the cucumbers are starting to take off, though we've lost one the other cucumber. We also lost a pepper plant. The pepper has been replace with two more plants of a different variety. They'll come a bit sooner than the one that died off so we should have a more even crop of peppers this year. The leeks look great, the snow peas are thriving, the potatoes have even started to pop up! We've been eating all sorts of lettuce and our herbs have made a mojito and a caprese salad already. The raspberries and the blueberries don't have any fruit yet but the bushes are much bushier than they were last year. 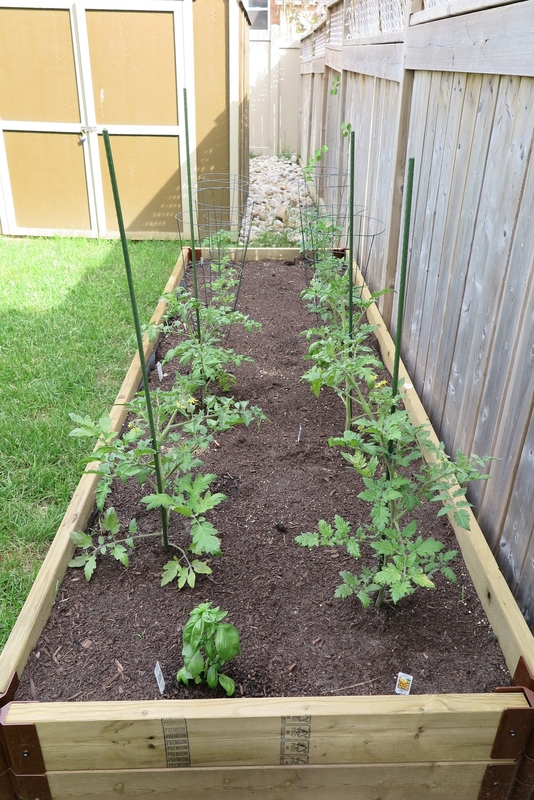 There are a few flowers on two of the tomato plants already and the romas are really starting to come along. Can you see those potatoes? Can you pick out the dead cucumber? May 25 Mary, Mary, quite contrary... Let's just hope my garden grows.